To (re)read the 2nd part of this journey, go here. There are many reasons why there is very little known about the sacred mushrooms of the Americas. As was explained in the previous post, the Spanish conquistadores completely outlawed any form of traditional practice involving indigenous spiritual belief systems. 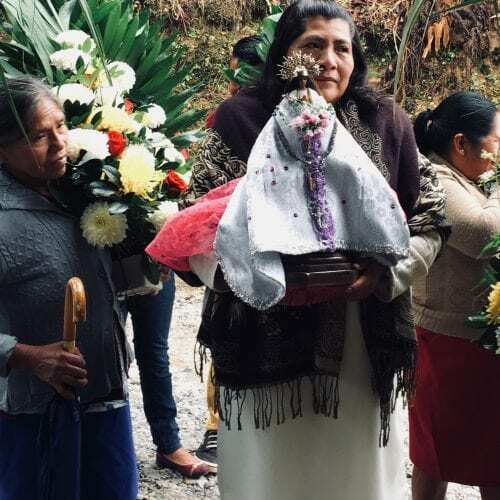 In the Sierra Mazateca, this meant that many native people converted to Catholicism and even the mention of their sacred mushroom (which was still used in their pre-Colombian rituals) was completely taboo up until the nineteen- seventies. This is a picture taken by Heather Fern Vuchinich of a modern Mazateca ritual, incorporating Catholic symbolism. When Michael Stuart Ani first moved to the Sierra Mazateca of Oaxaca in the end of the 1960s, his close friend’s mother was the local healer in a remote ranchero and performed mushroom rituals, but her son never heard her mention the mushroom’s name once in his entire life. 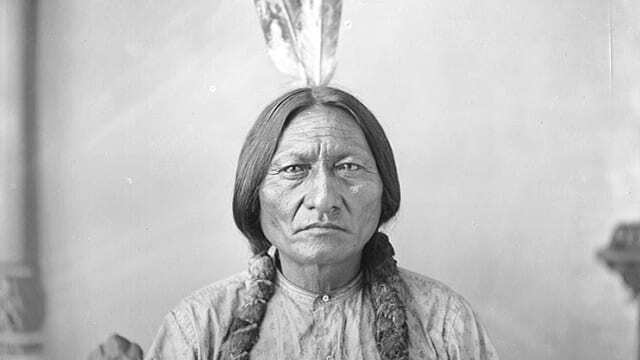 Imagine something so sacred you couldn’t even speak its name, and by not speaking it, the natives kept its secret for a very long time. It appears that the sacred mushroom picked some of the most tightlipped people in the world to keep its secret. History tells us that back in the 16th century the Spanish conquistadors were the first outsiders to pierce its secret and witness sacred mushroom rituals. Their friars, (most notably Bernardino de Sahagún) wrote a couple of passages about the rituals, but because of religious restrictions did not examine in any detail one of the main sacraments of the Aztec’s religion. 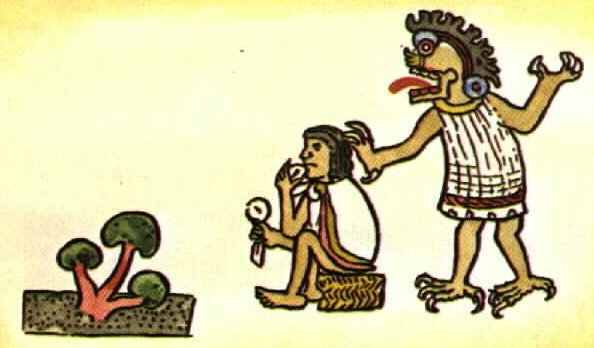 In general, the Aztec called all the many different varieties of sacred mushroom Teonanácatl, the “Astonishing Gift of the Gods.” The Spanish Inquisition changed the name to the “Flesh of Gods,” which made its use blasphemous in the eyes of the church, who had damned it as the devil’s tool. By doing so they once again protected the sacred mushrooms’ secret by driving it underground and destroying any record of its existence. The mushroom’s greatest trick to keeping its secret was convincing people it didn’t exist. In an attempt to completely eradicate the native spiritual beliefs of Mesoamerica, the Spanish Inquisition burnt thousands and thousands of pre-Colombian holy books called codices and subsequently the sacred mushrooms secret was once again protected. Out of all these codices less than twenty have survived and curious as it is, some of the ones that did survive depict ancient mushroom ceremonies and its sacred Ghost Dance. The most well-known are the Codex Mixteca, Codex Florentine, Codex Vienna and the Codex Borgia, which left just enough clues to imply that the sacred mushroom was uniquely important to the Mesoamerican culture. Outside of these codices and what the monks wrote, the only other sources of information about the ancient mushroom rituals of the Americas were oral tradition and the mushrooms themselves. It is the native tradition that if you win the sacred mushroom’s trust, it will tell you its secrets. But winning the trust of a sacred mushroom is not an easy task. And so, for the next three hundred years the secret story of the sacred mushrooms remained just that, a secret, until…. Read more about our other projects here.